(4:30 p.m. EDT) -- The first private island to be owned by a cruise line is getting a makeover. 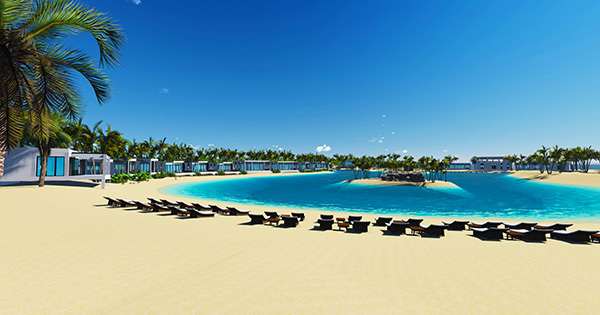 Great Stirrup Cay, purchased by Norwegian Cruise Line in 1977, will receive new attractions, dining venues, private villas and a lagoon as part of Norwegian's $400 million upgrade program "The Norwegian Edge." The new additions to the island will cost $1 million in landscaping alone. Among the many renovations planned for the 250-acre Bahamian island are two zip lines, an underwater sculpture garden and a boardwalk. The 1,000-foot zip line course will have two parallel zip lines so you can say hi as you pass your friends. The underwater sculpture garden provides opportunities for snorkelers and divers to explore under the sea (complete with waterproof map). Great Stirrup Cay's beach will receive a half-mile boardwalk with more than 100,000 square feet of walkway. New shaded areas with benches have also been added, as rest stops. Adjacent to the beach will be a new half-acre complex featuring basketball and volleyball courts, Ping-Pong tables and a stage for live music and entertainment. The area will also have bleachers, a shaded picnic spot and an air-conditioned reception area where cruisers can rent board games, make reservations and use changing rooms. Once cruisers have worked up an appetite, they'll be able to stop by Abaco Taco, Great Stirrup's new -- and free -- customizable taco bar, located near the entertainment complex. Or, they can check out the LandShark Bar & Grill, drawing from the line's partnership with Jimmy Buffett. Menu items will be priced a la carte, and indoor and outdoor seating will be available. All existing bars and restaurants will be updated, including new decking, shaded areas, and high-top seating at all bars along with family-style seating, which will increase seating capacity at all dining venues by 50 percent. The island's 8,500-square-foot buffet will be redesigned for efficiency, and seating will be added there as well. Also on the island will be all-new lockers and restrooms in the tender area. Making its debut is the Lagoon Retreat, a private area featuring a secluded beach, oceanview restaurant, covered family area, four-room Mandara Spa, and 22 air-conditioned villas. 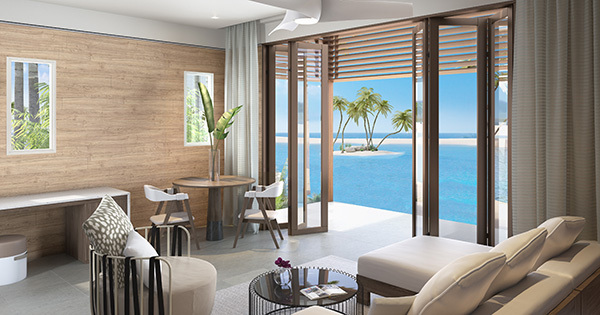 The Lagoon Retreat will also feature a swim-up bar; family beach area with shallow water; a grassy area for activities or dining at picnic tables; the Silver Palm, a complimentary restaurant with indoor and outdoor seating as well as a rooftop terrace. A private room that can accommodate up to 75 people for private functions or celebrations (catering is available) will also be added. Several villa types will be available. Studio villas will accommodate two to four people, one-bedroom villas will accommodate four to six people, and two-bedroom villas will accommodate up to 10 people, with two bathrooms. All villas feature an outdoor terrace, private bathroom, and living and dining areas; hot tubs will be offered in one- and two-bedroom villas, as well. All food and beverage services will also be offered in the private villas, as well. Cruisers who rent one of the beach villas will be driven from the tender docking area to the Lagoon Retreat's reception center via an air-conditioned shuttle. Access to the Lagoon Retreat will be available to Haven and other suite passengers, as well as anyone who purchase an on-island Mandara Spa service. A limited number of Lagoon passes will also be available to all passengers for purchase on each sailing.